... with S&P futures trading near session highs. "There has yet to be any positive developments on trade tensions, but the rebound of the U.S. stock market from an intra-day low helped,” said ANZ FX strategist Irene Cheung. "China’s stronger-than-expected yuan fixing should help to calm the market and the visit of the North Korean leader to China suggests that perhaps there is room for trade negotiations" she added. ... and 51% drop in EPS over the past year. 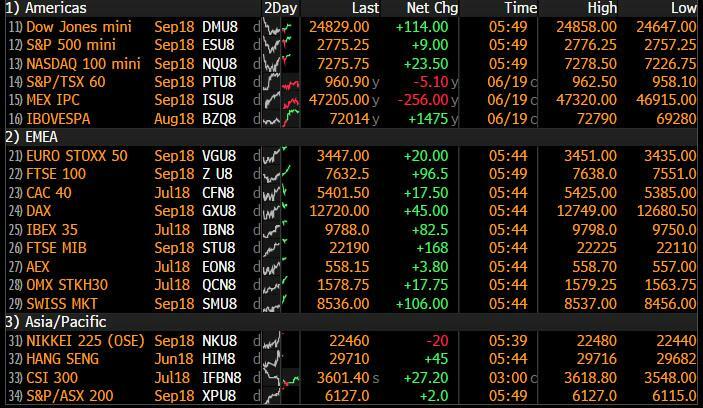 With lack of new trade war rumblings, traders were quick to add to risk around the globe, and European stocks also rose adding to momentum from Asia, as the panic surrounding a potential global trade war showed signs of easing. The European rally was broad-based with every sector advancing in the Stoxx Europe 600 Index, which jumped following three days of losses. Earlier in Asia, shares in Japan and China both reversed declines, even though the Shanghai Composite Index was unable to rebound above the 3,000 level it fell through on Tuesday. The Shanghai Composite gained 0.5%, the most since June 12, after falling as much as 1.2% in morning; Shenzhen Composite Index likewise advanced 1.4% higher, while Hong Kong’s Hang Seng Index added 1.4%, and the Hang Seng China Enterprises Index +0.9%. Consumer staples and health-care stocks lead gains in both markets; firms’ reliance on domestic market makes them largely immune to a China-U.S. trade war. China's 10-year treasury futures dived near 0.5%, the biggest drop this month, due to profit-taking amid improving risk sentiment. It surged 0.4% on Tuesday as China’s stock market crashed. 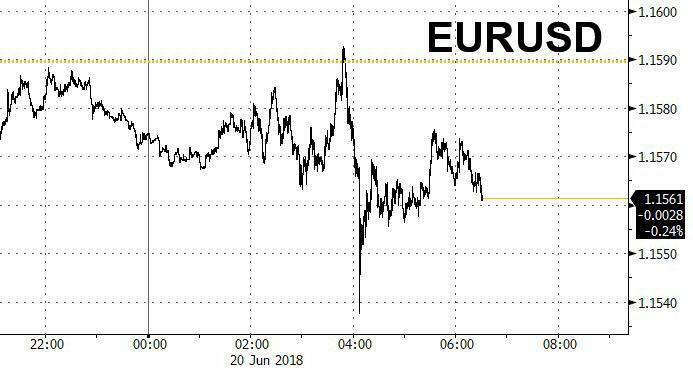 There were some fireworks in FX trading, where the euro whipsawed as the market’s knee-jerk reaction to comments by ECB policymakers came amid otherwise muted flows. Ahead of the ECB's Sintra conference conclusion later today, the EUR briefly erased an early loss after Bank of France Governor Francois Villeroy de Galhau said in a letter released Wednesday that the first ECB interest-rate rise “could come as of the summer of 2019.” Villeroy later specified that his comments were in line with the Governing Council’s rate guidance issued after its June 14 meeting. "What we also see, is that we have a development of the exchange rate that’s leading to a significant weakening of the exchange rate against the dollar. That’s surely primarily a development of the interest-rate policy, where the ECB wants to keep its rates on hold at least until summer of next year, while the U.S. has announced rate hikes, so that the difference between European and U.S. rates becomes stronger." The EURUSD then subsequently steadied near 1.1560 as options-related bids above 1.1500 kept absorbing selling pressure while offers according to three traders quoted by Bloomberg. Elsewhere, the onshore yuan jumped after the People’s Bank of China set its daily reference rate at a stronger level than all analyst and trader projections. Specifically, the PBOC set the reference rate at 6.4586, while the fixing was seen at 6.4705, according to the average of forecasts by 23 traders and analysts in Bloomberg survey; forecasts ranged from 6.4663 to 6.4817. The gap between the survey and fixing is widest since Bloomberg started to release the average forecast in August. "The fixing was a lot stronger than expected to take some pressure off the yuan and prevent a negative feedback loop between the currency and stocks", ANZ senior strategist Irene Cheung says adding that "China doesn’t want the exchange rate to become another uncertainty as the U.S.-China trade war escalates." Separately, the Bloomberg Dollar Index reversed earlier Asian-session losses following buying after the London open, and was fractionally higher on Wednesday. Part of the dollar strength came from a weakening pound ahead of a second vote on whether the U.K. Parliament should get a say on what happens if there’s no deal at the end of the Brexit talks with the EU. Sterling dropped 0.2% to touch 1.3148, a fresh seven-month low. As Bloomberg explains, if the House of Commons decides in favor of Parliament having a “meaningful vote” it could have an impact on Prime Minister Theresa May’s political future and the path Brexit negotiations take. The relative calm spread to emerging markets, which had been hit hard in recent weeks, but developing-nation risk assets rose on Wednesday, paring their plunge a day earlier. 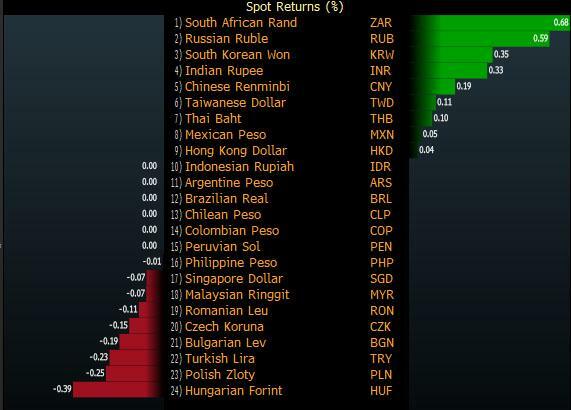 And while there were no major outliers in the FX space, Turkey’s lira fell again, before an election this weekend. US Treasury yields were unchanged at 2.896%. Germany’s 10Y yield rose less than 1bp to 0.38%, the first advance in more than a week, while Britain’s 10Y Gilt yield also gained 1 bp to 1.283%, also its first advance in a week. Meanwhile, Italian 10-year yields dropped 2 bps to 2.535%, the lowest in almost four weeks. Commodities are trading mixed with oil extending gains as energy ministers emerge ahead of the key OPEC+ meeting later this week. WTI reclaimed the USD 65/bbl overnight, and is now eyeing USD 65.50/bbl while Brent trades north of USD 75.50/bbl. Yesterday’s API inventories printed a larger than expected draw, in which energy prices gradually edged higher in the aftermath. In terms of comments, the Russian Deputy Energy Minister expressed the country is ready to talk about all OPEC+ proposals and they expect to reach an agreement in terms of an ease in output cuts by June 23rd, while the Nigerian Energy Minister stated all options are on the table, however it is too early to tell if they will support a hike in production. An Iranian official said Iran will only accept production increases to push compliance to 100% on the condition that producers stick to their quotas. Elsewhere, oil output in Libya dropped to 700k BPD from just over 1mln BPD amid conflict in the region. Moving onto the metals complex, gold (-0.3%) trades lower on the day, subdued by a firmer dollar. London copper futures bounced off 3-week lows following a near-2% loss during Tuesday’s session although escalating trade tensions cap any recovery in risk appetite. Elsewhere, iron ore futures trimmed losses amid a 5% drop in Chinese iron ore outputs for May while Shanghai steel rebounds after slumping nearly 3% in yesterday’s session. On today's calendar, expected data include MBA mortgage applications, current account, and existing home sales. 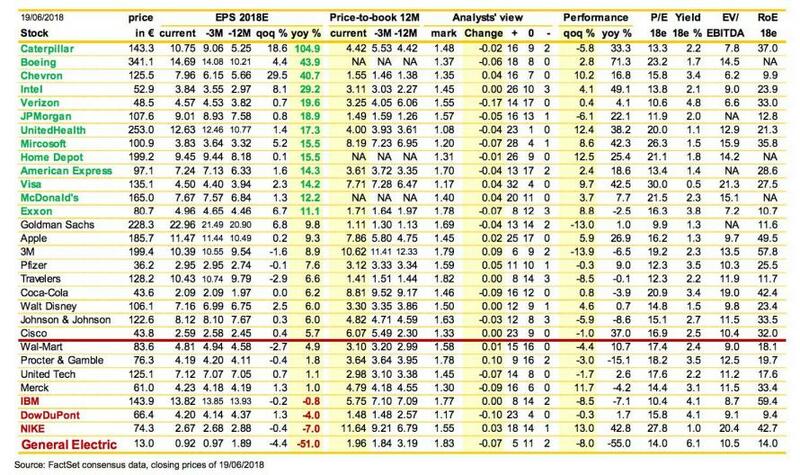 Micron and Actuant are among companies reporting earnings. ECB President Draghi, Fed Chair Jerome Powell, RBA Governor Philip Lowe take part in a policy panel in Sintra, Portugal. Asia stocks traded mixed as the region attempted to compose itself from the prior day’s sell-off and after some late reprieve on Wall St. where the majors still finished negative but well off worst levels, aside from the DJIA which underperformed as industrials and materials suffered the brunt of the heightened trade tensions. 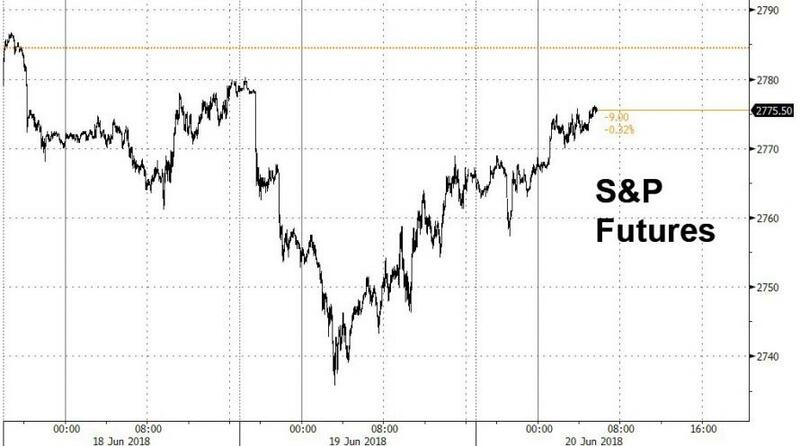 ASX 200 (+1.0%) was the biggest gainer and reached its highest intraday level in a decade with upside led by its largest weighted financials sector, while Nikkei 225 (+0.6%) traded indecisive and at the whim of a choppy currency. Hang Seng (+0.3%) swung between gains and losses, while Shanghai Comp. (-0.6%) remained downbeat on the tariff-threat overhang. Finally, 10yr JGBs are marginally lower with demand sapped by the improved picture in the region, although downside was also limited amid the indecision throughout most of the session in Japan and with the BoJ present in the market for JPY 690bln of JGBs in the belly to super-long end. European equities are recovering some of the losses seen yesterday as trade war news flow slows. The FTSE 100 is the outperforming bourse, coming off of month lows hit in Tuesday’s trade, as the GBPUSD extends losses at 6 month lows. The DAX is currently underperforming, with automotive names hit (Continental (-0.6%), Daimler (-0.5%)).Volkswagen (+0.8%) is bucking the trend, however, following an announcement of a possible alliance with Ford to develop and make transporter vans as according to sources. Imperial Brand’s (+3.0%) naming as a top pick at Liberum has pushed the co. to the top of the FTSE 100. Dialog Semiconductor (+2.2%) confirmed it is in discussions on a potential acquisition of Synaptics and is to proceed with due diligence. Commodities are trading mixed with oil extending gains as energy ministers emerge ahead of the key OPEC+ meeting later this week. WTI reclaimed the USD 65/bbl overnight, and is now eyeing USD 65.50/bbl while Brent trades north of USD 75.50/bbl. Yesterday’s API inventories printed a larger than expected draw, in which energy prices gradually edged higher in the aftermath. In terms of comments, the Russian Deputy Energy Minister expressed the country is ready to talk about all OPEC+ proposals and they expect to reach an agreement in terms of an ease in output cuts by June 23rd, while the Nigerian Energy Minister stated all options are on the table, however it is too early to tell if they will support a hike in production. An Iranian official said Iran will only accept production increases to push compliance to 100% on the condition that producers stick to their quotas. Elsewhere, oil output in Libya dropped to 700k BPD from just over 1mln BPD amid conflict in the region. Moving onto the metals complex, gold (-0.3%) trades lower on the day, subdued by a firmer dollar. London copper futures bounced off 3-week lows following a near-2% loss during Tuesday’s session although escalating trade tensions cap any recovery in risk appetite. Elsewhere, iron ore futures trimmed losses amid a 5% drop in Chinese iron ore outputs for May while Shanghai steel rebounds after slumping nearly 3% in yesterday’s session. In currency markets, it was all eyes on the EUR which in contrast to broadly still waters elsewhere, some choppy price action on early ECB commentary from the Sintra symposium as the single currency rebounded further from Tuesday’s lows and towards 1.1600 vs the Usd on an apparent less dovish nuance from Villeroy vis-à-vis rate guidance (subsequently corrected to conform with consensus), but then retreated to sub-1.1540 when Nowotny noted Eur depreciation vs the Dollar on divergent interest rate policy. Technically, 1.1510 is still nearest support vs circa 1.1600 resistance and the 20DMA at 1.1686. CHF/JPY: Both on the back foot vs a firm Greenback, as the DXY holds above 95.000 and risk sentiment overall stabilises, but with the Franc also increasingly wary about SNB intervention via Thursday’s policy meeting in the shape of NIRP and direct FX action should the Chf strengthen too much. Usd/Chf hovering above 0.9950 and Eur/Chf over 1.1500. Meanwhile, after largely irrelevant and rather dated BoJ minutes Usd/Jpy has bounced off yesterday’s base into a firmer range around 110.00, but perhaps capped by decent option expiry interest at and north of the big figure (around 2 bn from 110.00-05 and then between 110-40-50). GBP/CAD: Still hampered by Brexit and NAFTA uncertainty, with Cable struggling around a chart pivot at 1.3165, while the Loonie has extended losses vs its US counterpart to 1.3300+ and appears vulnerable or primed for a test of 12 month lows at 1.3348. Looking at the day ahead, the ECB’s Villeroy, Knot, Lautenschlager and Coeure will speak at separate events while at Sintra there is a policy panel featuring President Draghi, Fed Chair Powell and BoJ Governor Kuroda. So expect lots of headlines. Away from that, Germany’s PPI for May, UK CBI selling prices data for June and May existing home sales in the US will be released. Elsewhere, the OPEC International Seminar is due to begin in Vienna. A quieter day at the World Cup yesterday but glancing at Russia vs Egypt last night reminded me of one of my favourite jokes. What do you call a young river in Egypt? Punchline at the end after the day ahead. Not even an ancient Egyptian prophet could be expected to predict the exact path of this escalating trade war at the moment. The war of words are clearly worsening though and markets are starting to move towards pricing in this not being a short-term spat. It’s fair to say they have a long way further to fall if a compromise isn’t found, but we also have to try to work out what Mr Trump’s agenda and goal is. Is this a genuine crusade to get huge concessions from the Chinese or is he making a calculated gamble ahead of the mid-terms and will be happy to get relatively small last minute concessions that he can grandstand to voters? The problem with the latter outcome is that we have 4 and half months until voters go to the polls and thus plenty of potential uncertainty. Maybe Mr Trump is a master tactician as the tax cut does give the US economy and equity markets enough strength for him to be able to avoid blinking for now. For someone that focuses on equity markets like Mr Trump, the S&P 500 is still up +3.33% in 2018 (DOW went negative YTD again yesterday though) and outperforming virtually every other main global equity market. With Chinese equities down -3.5% to -5.8% yesterday and down c0.5% this morning, his actions are creating more issues for others than himself on a relative basis at the moment. Until the pain in US markets is higher, then he may carry on with his current tactics. The negative trade rhetoric continued after we went to print yesterday. President Trump told the National Federation of Independent business that “we’ve got to do something about it….we’re going to make it fair”. Meanwhile, White House adviser Navarro said “China does have much more to lose than we do” and that “China may have underestimated the strong resolve of President Trump”. On the other side, China’s PBOC sought to calm market sentiment as it indicated the central bank was prepared for outside shocks and “we’ll be forward-looking, prepare relevant policies and comprehensively use all kinds of monetary policy tools”. Meanwhile, Governor Yi also said China “has room to face all sorts of trade friction”. This morning in Asia, markets are broadly higher with the Kospi (+1.03%), Nikkei (+0.56%) and Hang Seng (+0.41%) modestly up while Chinese bourses are down 0.1% to 0.6% as we type. Meanwhile China’s Yuan is slightly stronger vs. the dollar for the first time in three days (+0.10%) while futures on the S&P are marginally up. Elsewhere onto the latest BOJ minutes, most members said it was appropriate to stop providing the projected timing on when the 2% inflation target will be achieved. Members also agreed that even if the projected timing was reviewed in the latest meeting, the Bank’s monetary policy stance would not change at all. Turning back to trade tensions and its potential impacts, DB’s Zhiwei Zhang and team have updated their analysis and estimate that if the trade war escalates to include US$200bn of Chinese exports at a tariff rate of 10%, it would have a meaningful impact on both sides, with the cumulative impact on China’s GDP growth at 0.2-0.3ppt (this includes the 25% tariff on the first $50bn of exports). The products affected would likely include consumer goods, which the US government has so far been carefully trying to avoid hitting. Notably, the big question on our economists’ mind is whether China will move beyond trade and target US business interests in China. The team estimate that US firms sold US$448bn worth of goods and services to China in 2017, with c37% through trade and c63% ($280bn) through local operations by US subsidiaries in China. Overall, China has not threatened officially to target US firms in China, but it’s one to watch and a risk that our economists see as rising as trade tensions build. Our US economists’ base case remains that the trade conflict with China will be settled before it progresses significantly beyond the initial imposition of tariffs on $50bn of imports in both directions. However, recent events have clearly increased the risks that the conflict will begin to have measurable negative economic effects. If things deteriorate further, there is the possibility of a stock market correction in the -5% to -10% range, although if a settlement is then negotiated quickly, equities could recover and the risks to GDP mitigated. However, if a trade war gathers further momentum, it could well induce the next recession. As for markets yesterday, risk assets sold off while core bonds and the Yen firmed as the US / China trade tensions intensified. China’s Shanghai. Comp. dropped -3.78% to a two year low, while European bourses also weakened, with the export biased DAX (-1.22%) leading the decline. That said, the Stoxx 600 (-0.70%) and S&P (-0.40%) was relatively resilient, as the latter staged a steady recovery throughout the day while the domestically focused small- cap Russell 2000 index edged up +0.06%. 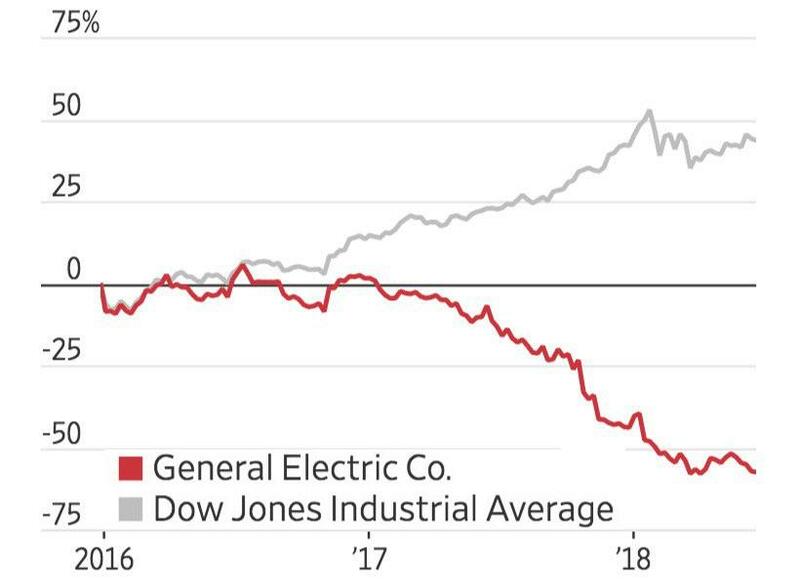 Within the S&P, materials and industrials stocks that are more exposed to a potential trade war with China underperformed (GM -3.9%; Boeing -3.8%; Caterpillar -3.6%), while telco, health care and utilities stocks all advanced. Meanwhile the VIX rose for the second straight day (+8.5% to 13.35). Government bonds firmed on the back of flight to safety and continued dovish commentaries from the ECB. 10y yields on US treasuries fell as much as 6.6bp intraday before closing -2bp lower at 2.897%, while Bunds (-2.6bp), OATs (-2.1bp) and Gilts (-4.1bp) were also in demand. The US 2s10s spread has nudged 1.5bp lower yesterday to a fresh post GFC low of 35.2bp. In Europe, Mr Draghi seemed to reinforce the ECB’s dovish stance as he noted “we’ll remain patient in determining the timing of the first rate rise and will take a gradual approach to adjusting policy thereafter”. He added that “the path of very short-term interest rates that is implicit in the term structure of today’s money-market interest rates broadly reflects these principles”. Meanwhile, the ECB’s Liikanen took a step further and added that the ECB can hold rates steady even after summer 2019 “if necessary”. In commodities, soybeans fell to a fresh c2 year low (-2.20%) while wheat (-2.39%) and base metals (Copper -1.07%; Zinc -0.89%; Aluminium -1.12%) retreated on higher trade tensions. WTI oil also traded lower ahead of this Friday’s OPEC meeting (-1.18%). Over in FX, the US dollar index firmed for the first time in three days (+0.27%) while the Euro and Sterling fell -0.28% and -0.54% respectively. Away from the markets and onto “a new chapter” for the EU as termed by Germany’s Merkel. After her meeting with French President Macron, Chancellor Merkel said Germany and France has agreed to cooperate to reform the EU’s asylum system as we both “understand the topic of migration is a joint task” and “our goal remains a European answer to the challenge”. Elsewhere, the two leaders agreed to an in principle plan to strengthen the Euro area, including setting up a euro-area budget and a crisis backstop under the ESM (European stability mechanism). Overall, Ms Merkel summed it up as “an important step for Europe….we can say we’ve taken a small step along the road”. Meanwhile Mr Macron suggested the proposal will be presented to other countries, with specifics to be worked out later this year and the plans to take effect from 2021. Staying with Europe, today sees a key Brexit vote in the U.K. House of Commons and again covers how much say parliament should have on the final deal or if negotiations break down. If the Government loses it could have major implications for PM May so one to watch. Before we take a look at today’s calendar, we wrap up with other data releases from yesterday. In the US, the May housing starts rebounded more than expected, up 5% mom to 1.35m (vs. 1.31m expected). Conversely, housing permits fell more than expected at -4.6% mom to 1.30m (vs. 1.35m), but annual growth is still up 8% yoy and broadly in line with growth in recent months. In Europe, the ECB’s April current account surplus was narrower than last month at €28.4bn (vs. €32.8bn previous), but still lifted the 12-month running surplus to a new high of €410bn.